Canadian astronaut David Saint-Jacques initiated plant experiment Veg-03 H aboard the International Space Station on Saturday, March 9, 2019. This required Saint-Jacques to add water to “plant pillows,” which are space pots for plants that contain pre-packed seeds, granular media for the roots to grow into, controlled-release fertilizer, and a way for the on-orbit gardeners to water their plants in microgravity. The experiment should take 30 days to complete and will provide data on food safety for the new crops to compare to ground studies in order to establish a baseline. Canadian astronaut David Saint-Jacques began growing two new crops aboard the International Space Station on Saturday, March 9, 2019. The two crops, Wasabi Mustard Greens and Extra Dwarf Pak Choi, are part of experiment Veg-03 H. Saint-Jacques placed six “plant pillows” into the veggie growth chamber. 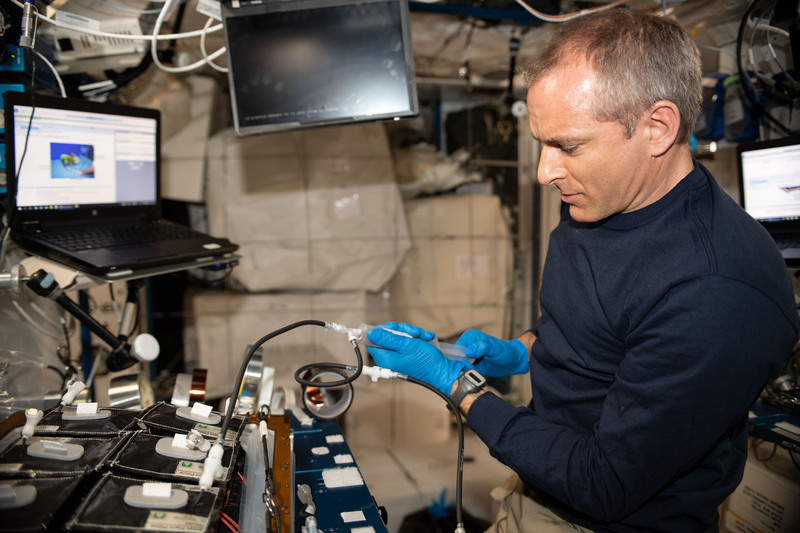 This experiment is part of ongoing research on the space station and on Earth to identify fresh vegetables capable of providing astronauts food and nutrition during long-duration spaceflight, including future missions to the Moon or Mars. Each pillow serves as a pot designed for space with pre-packed seeds, a substance for the roots to grow into, controlled-release fertilizer, and a way for the in-orbit gardeners to water their plants in microgravity. High school and middle school students participating in the Fairchild Tropical Botanic Garden’s Growing beyond Earth Challenge identified Extra Dwarf Pak Choi as a potential candidate crop for space through classroom science experiments, along with Dragoon Lettuce, which NASA astronaut Serena Auñón-Chancellor grew on the station last fall. Using science stations designed to mimic conditions on the space station gave students a chance to grow plants and record data that NASA was able to use. Those experiments culminated in the plant species which launched to the space station aboard the 15th SpaceX cargo resupply mission on June 29, 2018, along with three other plant species. The experiment should take 30 days to complete and will provide data on food safety for the new crops to compare to ground studies in order to establish a baseline.